It already feels like winter is upon us in some parts of the country, and you may find yourself thinking about purchasing a new snow blower to make those mornings after a blizzard a little easier. With all of the options on the market, it can be difficult to decide which type of machine is best for you. Ariens Co., often called the King of Snow, can probably help. The company didn’t earn that distinction easily. It has more than 80 years of snow-clearing expertise under its belt. Recently, we spoke with Ariens snow product manager Amanda Marsicek on what features to look for when buying any brand of snow thrower. Here’s what you should know before heading to your local dealer. When you’re doing your research, you’ll find that most brands offer both single- and two-stage solutions. So, what’s the real difference between a single-stage machine versus a two-stage machine? “A two-stage snow blower has two operating parts that make up the unit — an auger and an impeller — so the snow is first impacted by the auger, which helps break it up, and it’s then taken up and out through the impeller. With a single stage, you don’t have the auger — that first stage of impact — so it’s easy to see why a two-stage machine is really necessary for any significant amount of snowfall,” Marsicek says. 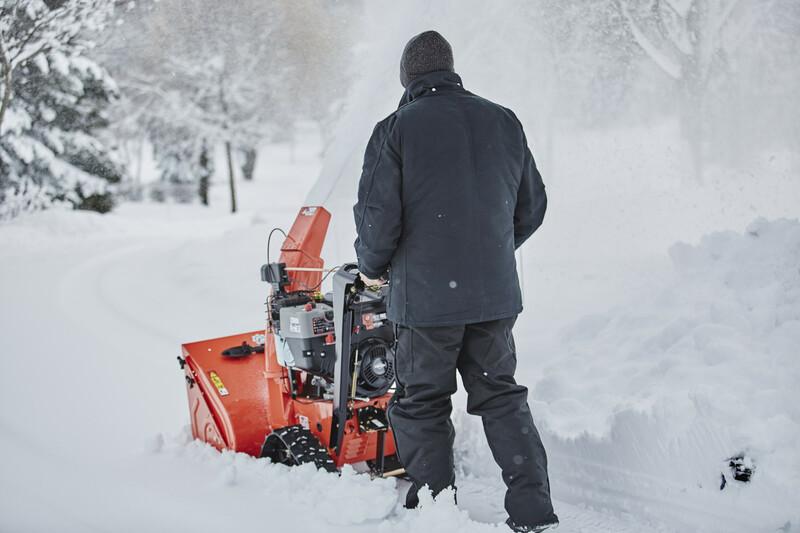 While a single-stage snow thrower might not be ideal for all situations, it can be the perfect solution for professional landscaping crews, facilities maintenance managers or residents who live in heavy urban environments. Its lightweight and ease of maneuverability allow it to be easily loaded in and out of trailers by crew members, and single-stage machines are the perfect size for those who only need to clear a sidewalk or short, single-stall driveway. In addition, the single-stage’s compact design helps it easily fit into tight storage spaces. So, if you’re reading this and have decided that a single-stage snow blower is not enough machine for you, don’t fret. Two-stage machines are the most popular option and come in many different shapes and sizes. Another thing to remember, however, is that the larger snow blowers can be heavy and difficult to maneuver for some. To counteract that, several brands offer some type of auto-turn technology, making operating the machine easy and doable for all members of the family. Often, as you move up snow thrower product lines, the features and engine offerings increase. Things like larger tires, hand warmers, quick-turn chutes and drift cutters are often offered. For particularly tricky snow removal situations, many brands also offer track models, which can tackle any type of terrain. “Track models are going to be for homeowners or prosumers who have a hillier terrain to clear,” Marsicek says. Regardless of your snow removal challenge, there is a solution to help make it easier. Our best advice is to do your research and talk with your local dealer about which option will work best for your unique situation. Jessica Bedore is the public relations coordinator for Ariens Co.
@CompactEquip @Ariens @GravelyMowers Luv my Ariens that i bought last november. Critical for us being on a corner lot with 2 driveway ends!